On May 4, 2015, Dean of the College Rakesh Khurana sat down in Cabot House’s Senior Common Room with graduate leaders of Harvard’s eight male final clubs. For years, administrators had used meetings with club leadership to ensure the groups were abreast of the College’s alcohol and sexual assault policies. From the start of his deanship, though, Khurana took a drastically different approach. Confidential meeting notes later circulated by the College made clear administrators’ vision for the single-gender final clubs: co-ed groups with open application processes. Just over one year after that meeting, on May 6 2016, University President Drew G. Faust accepted recommendations from Khurana that laid out an unprecedented policy. Starting with the Class of 2021, members of all unrecognized single-gender social organizations—including male final clubs, female final clubs, fraternities, and sororities—will be ineligible for leadership positions in recognized groups and will be barred from receiving College endorsement for coveted fellowships like the Rhodes. Despite functionally reversing Harvard’s near-three decade long stance towards unrecognized social groups, administrators have remained tight-lipped on the process behind the sanctions. In the aftermath of the policy announcement, certain alumni, male clubs, and women in female final clubs and sororities castigated the College’s decision, with many calling for its reversal. Though Khurana wrote in his letter announcing the sanctions that he developed the policy with “careful deliberation,” he publicly offered few details on what the letter referred to as over two years of engagement with stakeholders. But more than 100 pages of private meeting notes, emails, letters, as well as interviews with administrators and club members reveal that the process of creating the policy has been anything but smooth. Marked by tense meetings, allegations of arm-twisting from the Dean of the College, and charges of misusing survey data to argue for co-ed policies, many clubs argued that Khurana obfuscated his goals and relied on uncertainty while pressuring clubs to adopt gender neutral memberships. As uncertainty mounts for the future of the College’s unrecognized single-gender groups, some clubs are looking to modify membership practices to avoid administrative ire. The oldest of the final clubs, for instance, the 225-year old Porcellian, plans to overturn years of tradition to adopt a fraternity-like policy of open application for male students. But behind the scenes, several clubs are going to more extreme lengths: consulting lawyers, officially organizing alumni across single-gender groups, endorsing controversial candidates for top alumni-elected posts, and speaking out publicly in the hopes that Khurana will roll back a policy they say was built on fear and mistrust. To understand the College’s relationship with the final clubs, it is best to start in 1984. That year, the male clubs disaffiliated rather than accede to administrative demands that they accept women. 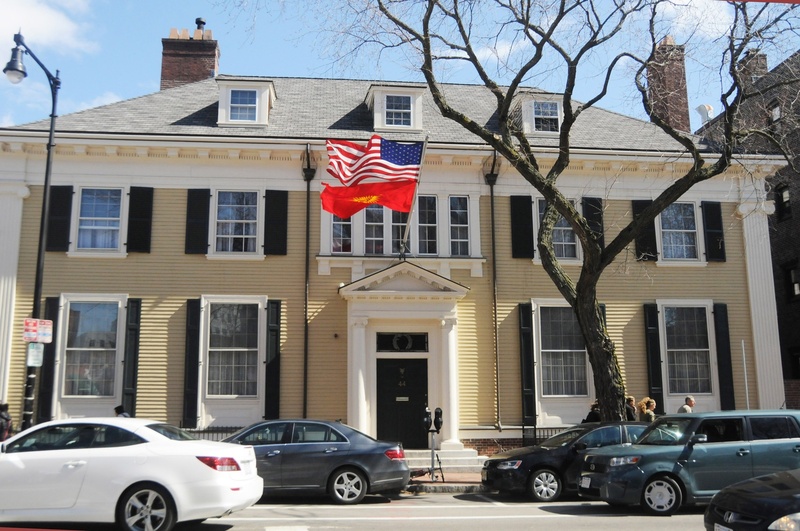 Still, the groups remained a relevant part of the school’s social life, frequently hosting parties at multi-million dollar clubhouses located just steps from Harvard dormitories. While the groups enjoyed virtual autonomy, administrators were critical of them, sometimes publicly. In 1998, then-Dean of the College Harry R. Lewis ’68, published a column in the Harvard Independent blasting some of the clubs for what he called their discriminatory practices and potentially dangerous atmosphere for women. “[O]ver the years the Clubs have ceased to seek recognition and have evolved into organizations which enjoy their status outside the pale. No University recognition means no University supervision,” added Lewis, who wrote in a recent email that he stands by the column. In the mid 2000s, the College began meeting regularly with the clubs to discuss safe partying practices and anti-hazing rules. Former Office of Student Life administrator Judith H. Kidd said she conducted meetings with the clubs when the University first re-engaged with them. Some topics, though, were never broached. “We did not go anywhere near their selection policies and anything like that,” Kidd said. An agenda for a meeting between graduate leaders of some male clubs and then-Interim Dean of the College Donald H. Pfister in 2013, for instance, listed “brainstorm[ing] efforts to reduce harmful behaviors and impact of activities in the clubs that land back in the Houses,” but made no mention of club membership policies. To that end, representatives from the Office of Sexual Assault Prevention and Response and the Office of Alcohol and Other Drug Services regularly briefed club leaders. By the time Khurana assumed the Deanship, administrators and clubs had reached an uneasy, if stable, equilibrium. From his first meeting with club leaders, though, Khurana took his own tack. Khurana reportedly asked club attendees at a fall 2014 meeting to think about “what their values are and the degree to which they align or don’t align with the mission of the College,” then-Dean of Student Life Stephen Lassonde told The Crimson shortly after the meeting. The following spring, College administrators again urged clubs to reconsider their single-gender membership policies in a meeting, according to two attendees and confidential notes distributed by Associate Dean of Student Life David R. Friedrich. The tone of the meetings intensified the subsequent fall, the same semester that two historically all-male clubs added women to their membership for the first time. In the wake of the announcements, though, one of his predecessors argued that he had strayed too far from standard administrative practices towards the clubs. “It seems to me that you are breaking dangerous new ground in articulating this standard and in interpreting it to disqualify students from captaincies and leadership positions,” Lewis wrote in a private letter to Khurana that was obtained by The Crimson. As clubs met with the College, administrators frequently emphasized their fears of sexual assault on the off-campus properties, later using statistics published in a University-wide report on sexual assault prevention released in early March to argue that the groups played an outsized role in sexual violence on campus. 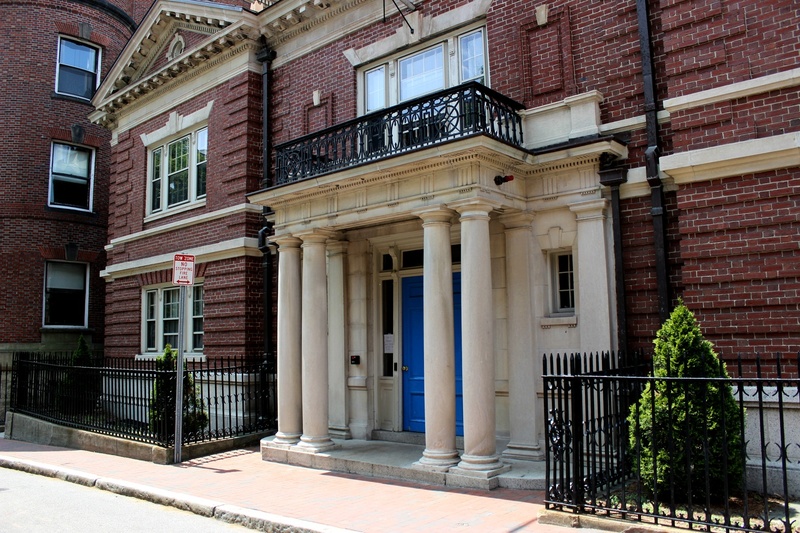 While administrators, according to a club’s internal notes on three meetings, have always voiced concern about gender equity and social inclusion, many club leaders argue that Harvard conflated these issues with sexual assault in an attempt to make a stronger case for co-ed membership practices. Male clubs have repeatedly attempted to limit the conversation solely to addressing sexual assault. The evening before Faust announced the new policy, for instance, leaders of the eight traditionally all-male clubs sent a letter to Khurana expressing their unanimous support for certain recommendations from the Task Force report, such as mandatory sexual assault prevention training for all students and training on hosting safe parties. When the final policy was released, Fly Club graduate president Richard T. Porteus ’78 argued that the administration had abandoned efforts to address sexual assault completely. “We’ve arrived at the point that to prevent sexual assault, the number one plan is to prevent sorority sisters from becoming Rhodes scholars,” Porteus said. That was not the first time Porteus, or other clubs, charged administrators with conflating three issues that, in their minds, were separate: sexual assault, gender equity, and social exclusivity. In a Sept. 17 2015 meeting between male graduate leaders and administrators, Porteus said he explicitly raised this concern. In multiple private letters to Khurana obtained by The Crimson, the Porcellian Club called on the College to focus efforts on sexual assault prevention and avoid pressuring the groups to go co-ed. Eugenia B. Schraa ’04, a former Crimson editor and co-founder of the all-female Sablière Society, said she also found it difficult to understand the logic behind forcing a co-ed change as a means of reducing sexual assault. “How does forcing clubs to go co-ed, how does that reduce the prevalence of sexual assault? I’m not sure,” Schraa said. In their criticisms of administrative conflation, Porteus and the Porcellian went so far as to question the statistical and methodological integrity of the University’s March report on sexual assault prevention. That report, citing survey data, reported that 47 percent of female undergraduate seniors participating in final clubs had experienced “nonconsensual sexual contact”—compared to an average of 31 percent for all senior women at the College. “The report is embarrassingly slanted, it really shouldn’t bear anywhere on it the name of a university that has ‘Veritas’ as its motto,” Porteus said. The Porcellian publicly charged that the report conflated sexual assault and other issues in a statement from then-graduate president of the Porcellian Charles M. Storey ’82 to The Crimson on April 12. The statement, particularly one sentence on the risk of sexual assault if clubs went co-ed, drew widespread controversy, leading to Storey’s resignation. In a Washington Post op-ed, Caitlin Flanagan, a contributing editor at The Atlantic who has written extensively on fraternity culture, voiced similar doubts, writing that “it would be almost impossible to concoct a more meaningless statistic” than the 47 percent figure. In the face of these criticisms, the University has stood by its report. Chair of the task force for sexual assault prevention and response and former University Provost Steven E. Hyman wrote in a statement that “the extensive qualitative data gathered at scores of meetings with Harvard undergraduates” bolstered the statistical claims. “While the combined data shows that sexual assault has many antecedents—leading the Task Force to make a diversity of recommendations—the Task Force could hardly ignore the significantly heightened risk to female students that was associated with Final Club activities,” Hyman added. Faust also defended the report in the wake of the Porcellian-commissioned analysis. Schuyler H. Daum ’12, an alumna of the all-female IC club, told The Crimson in April that the findings of the report were consistent with her experience as an undergraduate. Still, even some students supportive of the sanctions do not think they will properly address sexual assault. Shortly after a March 29, 2016 meeting where Khurana requested that undergraduate leaders notify him of potential plans to go co-ed by April 15, Sablière graduate president Ariel Stoddard ’10 sent a message to the Dean emphasizing that undergraduates needed approval from graduate leaders to enact major changes. On multiple occasions this semester, Khurana has referred to final clubs, most of which are Massachusetts corporations with alumni officers responsible for finances and governance, as organizations “led by our students,” repeatedly asking undergraduate leaders to consider changing their membership policies. Club leaders, both graduate and undergraduate, charge that Khurana pressured undergraduates to break with their graduate leadership when deciding whether to adopt gender neutral membership. When students and alumni met with administrators together, at an April 13 2016 meeting, for instance, Schraa said she was “surprised by the fear or the pressure that [undergraduates] had felt in the fall,” noting that one undergraduate woman said she was afraid that she would be expelled for her involvement in a club. Throughout negotiations with the clubs this year, Khurana repeatedly refused to rule out pursuing a policy similar to Amherst College’s, which prohibits students from membership in “fraternity-like and sorority-like organizations.” Khurana’s insistence that nothing was “off the table” sparked fear among undergraduates, with student leaders of the Fox club telling graduates in a letter that their “individual reputations and careers” were in jeopardy if they did not satisfy Khurana’s request. 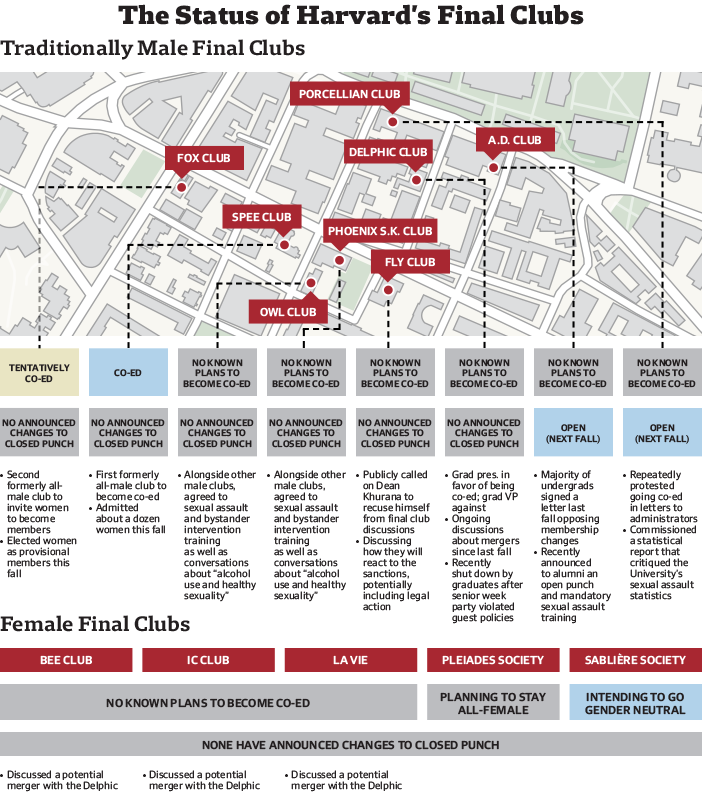 “In meetings last fall, [Khurana] suggested that Harvard has the power to prohibit its undergraduates from belonging to single-gender social organizations, including to the point of expelling undergraduates who did so,” the graduate president and vice president of the all-male Delphic Club wrote in a recent May letter to alumni that was obtained by The Crimson. Undergraduates of the Sablière Society this fall went as far as voting to go co-ed before their graduate board stepped in to prevent the change, according to Schraa. Since even before the announcement of the sanctions, Sablière leaders have indicated an interest in adopting gender-neutral membership policies, Schraa said. While Khurana issued an April 15 deadline to all clubs in the spring, undergraduates of the Fox Club wrote that the Dean imposed an explicit Nov. 1 deadline in the fall as well. A letter from Fox undergraduates and private meeting notes taken by one club report that Khurana requested information on possible co-ed plans for the purpose of crafting policy recommendations. Still, Fox undergraduates feared that failure to adopt co-ed practices by the given date could spur an administrative crackdown on club members. Citing pressure from the administration and what they called a hard deadline for action, undergraduates of the Fox unilaterally chose to accept women in October. In a letter explaining their decision to graduate leadership, they referenced a longstanding desire among undergraduates for a co-ed move and the “tremendous pressure” applied by Khurana and other administrators. The undergraduates’ decision to accept women without the approval of the graduate board created bitter internal division, ultimately giving rise to the “Friends of the Fox,” a group of alumni staunchly opposed to the co-ed move and angered by the undergraduates’s decision to forego graduate board approval. After the Friends of the Fox called on the graduate board to roll back the undergraduates’s changes, then-graduate board member Rex G. Baker ’05 drove to the clubhouse on Oct. 29 and convinced undergraduates to accept a “grand compromise,” according to an email Baker later wrote to other Fox graduates describing the process. The undergraduate-elected women became “provisional” members whose permanent fate will be determined by a graduate board vote. When Khurana was asked in the fall to respond to the Fox undergraduates’ letter, he declined to comment on its depiction of his actions. Khurana’s decision not to comment was one of many times—he also declined comment on this story—that he refused to publicly discuss communications with clubs, saying such meetings are confidential. But even in private, many female and male club leaders argue, Khurana played his cards close to his chest, leaving groups to guess at his eventual actions. In advance of the April 13 meeting, for instance, Porteus sent Khurana and other College administrators an email expressing frustration that after a “full year” of meetings with administrators, “no details” had emerged. In the email, Porteus requested yes or no answers to four questions on whether and how Khurana might impose sanctions on single-gender clubs. “In order to foster transparency within the Harvard community on a topic that has been an ongoing source of speculation,” Porteus sent a copy of the letter to a Crimson reporter. According to Porteus and three other meeting attendees, he did not receive definitive answers to any question at that meeting. In an interview in early May, Faust disagreed with the notion that Khurana has not been transparent, defending his approach as a process of soliciting opinion. Still, Schraa said the administration’s messaging “has been very vague and unclear,” though she said that administrative opaqueness could reflect an honest uncertainty over which course of action to pursue. Indeed, over the course of the year, administrators suggested the formation of policies markedly different from the one eventually announced. In the fall, according to notes taken by one club during a one-on-one call with the Dean, Khurana suggested that a potential policy could differentiate between single-gender organizations that have no interaction with non-members, and groups that throw parties or otherwise influence broader campus culture. Even as late as April 15, a private email from Associate Dean Friedrich to club leaders suggested that groups that did not interact with outside members might be treated differently under any policy Khurana recommended. “If clubs intend to remain single gender private organizations, it will help to understand what a private club would look like from your perspective and what policies would be put in place to eliminate external impacts on the campus,” Friedrich wrote, according to a copy of the email obtained by The Crimson. Reaction to the sanctions from national greek organizations suggest that some groups were unaware that they could be affected. Jonathan M. Pierce, a national spokesperson for the Alpha Epsilon Pi fraternity, said on May 6 that AEPi had not suspected it would be the target of any sanctions. The timeline surrounding Khurana’s policy actions has been a topic of confusion for single-gender groups. According to the Fox’s fall letter, Khurana told undergraduates that the University was preparing a report set to be released before the spring semester and that his recommendations to superiors were due by November 1. One club’s notes from the Sept. 17 meeting say that Khurana told clubs he would be “asked to report” within two weeks on where the clubs were in the process of going co-ed. In March, months later than initially projected, the University released its report on sexual assault prevention and Faust requested that Khurana develop recommendations by the end of the academic year. Khurana released his policy recommendations for the clubs on May 6. Adding to club leaders’ confusion were questions surrounding who in the administration would make the final policy decision and where the impetus for such a policy was coming from. A set of meeting notes from one club, for instance, reported that Khurana listed four parties that would have to approve policy: Dean of the Faculty of Arts and Science Michael D. Smith, the Office of General Council, President Faust, and the Harvard Corporation. Legal experts disagree as to the viability of a potential suit challenging the policy. Timothy M. Burke, an attorney with experience representing Greek organizations, said that while he saw grounds for a suit, he thought Harvard’s attorneys had looked carefully at the sanctions on single-gender organizations. The Corporation, meanwhile, regularly consults Khurana on final clubs, according to William F. Lee ’72, the Corporation’s senior fellow. According to notes on the Sept. 17 meeting taken by one club, Khurana said he had convinced top administrators to “give clubs a chance,” adding that he was one of few top officials who took that position. Khurana, through College spokesperson Rachael Dane, declined to comment on the meeting notes. Beyond his superiors at the University, club leaders say Khurana listed another source of pressure to reform the clubs’ practices: the Department of Education’s Office for Civil Rights, which is currently investigating the College’s compliance with Title IX, an anti-gender discrimination law. According to a club’s Sept. 17 meeting notes, Porteus, and the Fox Club’s letter, Khurana repeatedly referenced the ongoing Title IX investigation and the accompanying risk of losing federal funding if Harvard could not control the behavior of the off-campus, independently-owned final clubs. University Title IX Officer Mia Karvonides did not say outright that Harvard was responsible under Title IX for its off-campus clubs, and the Office for Civil Rights declined to comment on the ongoing investigation. Karvonides noted that Harvard’s sexual harassment policy and procedures includes off-campus conduct in its jurisdiction. Karvonides said she considers the final clubs in terms of how actions there might have a “spillover effect” on campus. In the wake of the policy announcement, a host of critics have made their displeasure known. While many of the policy’s detractors are themselves members of single-gender social organizations, independent media outlets and former high-ranking Harvard officials have also weighed in. Even beyond one of Khurana’s predecessors, former Dean of the College Lewis, former University President Lawrence H. Summers also came out against the sanctions. Despite taking issue with aspects of final club culture, Summers said sanctions are a step too far. In the midst of these public responses, College administrators have tried to privately maintain contact with undergraduate and graduate leaders of single-gender groups. The Sunday after sanctions were announced, Khurana reportedly met with student leaders of some single-gender clubs. Friedrich, meanwhile, has been scheduling phone calls with leaders of other groups. In one such conference call between Friedrich and Sablière leaders, Schraa said, administrators implied possible support from the College for clubs willing to go gender-neutral. On that call, Schraa said Assistant Dean of Student Life for Equity, Diversity, and Inclusion Emelyn A. dela Peña told Sablière leaders that being “risk-taking” under the new policy would yield benefits. Dela Peña added that the College was ready to “provide guidance and support” for a gender-neutral move. Still, many social clubs are not holding their breath for tangible news from administrators, instead focusing their efforts on mounting opposition to the new sanctions by reforming internal policies and organizing external action. Private email correspondences obtained by The Crimson indicate that members of at least one final club and one sorority circulated information on a controversial, and recently-failed, Overseers ticket which has publicly denounced the College’s recent sanctions. That ticket, calling themselves “Free Harvard, Fair Harvard,” has faced backlash for its central platform of eliminating tuition at the College and criticisms of race-based affirmative action. Ron K. Unz ’83, a candidate on that ticket, has also faced criticism for donations to a “quasi-white nationalist” group. Currently, various final club graduate leaders are gauging interest in a Special Interest Group centered around defending undergraduate involvement in unrecognized single-gender social organizations without threat of punishment or sanctions. To form a Special Interest Group, at least 50 alumni must receive approval from HAA after drawing up articles of incorporation, bylaws, and a constitution. So far, about 20 alumni of various single-gender social groups have signed on, according to an online spreadsheet obtained by The Crimson. While the Sablière has indicated its interest in adopting gender neutral membership policies, other clubs, like the all-female Pleiades Society, are committed to remaining single-gender at all costs. In an email to alumni, Pleiades leadership wrote that the club was “resolute in [its] commitment” to its current membership policies. In the fall, the formerly all-male Spee club, in an historic move, elected women into its membership, officially going co-ed. Graduate leaders of the Spee did not respond to request for comment for this story. Some all-male clubs have reacted to administrative pressure by tightening their guest policies and loosening their punch—the process by which clubs invite specific students to apply for membership. Earlier this spring the A.D. Club, after strongly opposing a co-ed move in the fall, adopted a members-only policy and announced an “open” punch process for men to be held this fall. In a private April 15 letter to Khurana, the Porcellian Club, the oldest of the final clubs, announced their intention to host an open punch this fall as well. In their letter, Delphic leaders DeSimone and Jacobson wrote that their undergraduates “will consider” hosting an open punch this fall. DeSimone and Jacobson also reiterated their members-only rules, which the Delphic instituted in the fall of 2013. Still, members-only policies are not always strictly enforced. While the Delphic technically operates under a no-guest policy, a party last week resulted in the closing of the clubhouse, according to a notice posted in a window the next day. According to the Delphic’s letter, they are also actively considering a merger with a female club, and have already had “introductory meetings” with the all-female Bee, IC, and La Vie clubs. Graduate leaders of those clubs either did not respond or declined requests for public comment for this story. And even at the Fox, the fate of its undergraduate membership remains precarious, as women— like many of their male peers elected this year—only enjoy provisional status. Meanwhile, fundraising has dropped off noticeably. Fox Club records show that earlier this spring, the club was over $10,000 behind in its projected alumni donations, leading the club to dip into its trust fund. In anticipation of a vote on whether the club will accept its provisional members this summer, Fox leaders conducted an extensive poll this spring to assess undergraduate and graduate members’ opinions on the issue. The results of the survey have yet to be announced. Because graduates have deemed that a co-ed move would alter the “fundamental nature or character of the Club,” the vote this summer must approve going co-ed by a two-thirds majority. Whether graduates vote in favor of the provisional members or not, there is little indication that the results of the vote will unify the fractured club. The Fox’s single-gender peers could see a similarly tumultuous future. 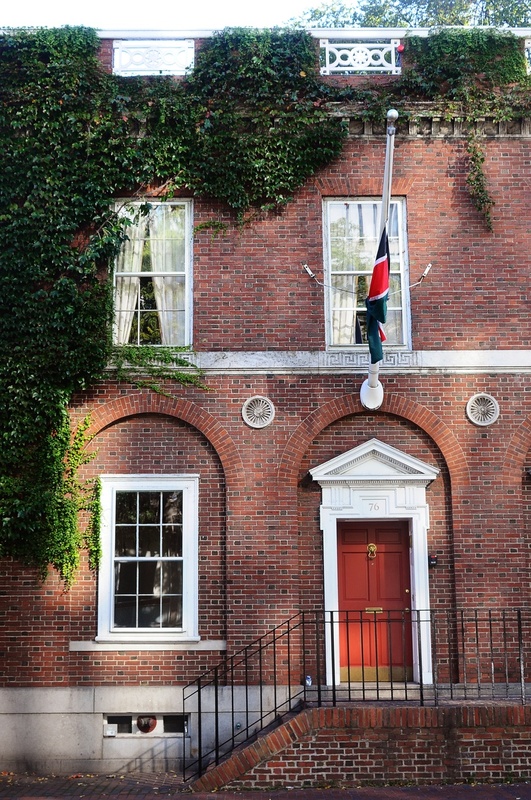 With the possibility of litigation on the horizon and the committee tasked with implementing Harvard’s policy yet to be appointed, final clubs will have little time to catch their breath before reaching crucial junctures in their respective histories. And as clubs work to decide their future, the administration is showing no signs of dialing back the pressure. —Staff writers Andrew M. Duehren and Daphne C. Thompson contributed to the reporting of this story.